President “Dad-Jeans Normcore” Obama stopped by the White House briefing room ahead of Labor Day to update the country on the crumbling world (ISIS in Iraq, Russia in Ukraine…), but because we’re all fried from the torrential downpour of bad news and already approaching weekend mode, all anyone could focus on was his terrible khaki-ish suit. The off-tan color can only be described as pallid, the fabric too heavy for the season, and the fit not good enough to make up for the rest. Obama doing this en route to a summer wedding? Suitghazi is an important moment for gender equity. 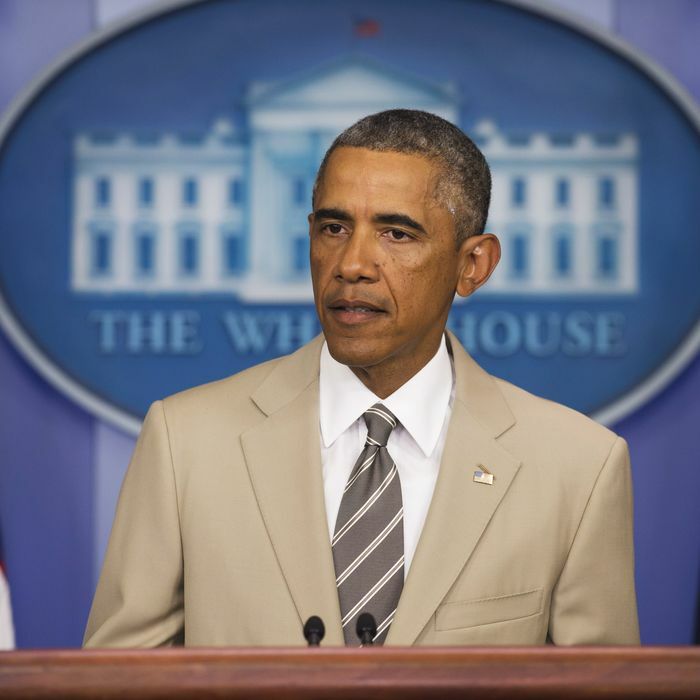 Did the president announce we're going to war while we were busy making fun of his terrible suit?